The United Feather and Down ® Down Encompass pillow was made to take all of the things that make a good down and feather pillow and combine them all into one pillow. By using an inter-locking, dual-core chamber design the United Feather and Down ® Down Encompass combines support and softness in a perfect balance. The inner chamber is packed tightly with 95% waterfowl feathers to keep your head and neck in alignment, preventing aches and pains. The outer chamber is made up of 75% waterfowl down to make your pillow very soft and give you the comfort you expect from a down pillow. 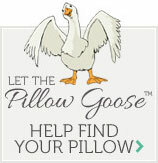 With this unique design the United Feather and Down ® Down Encompass pillow has everything you look for in a pillow. Order yours today and start sleeping better.